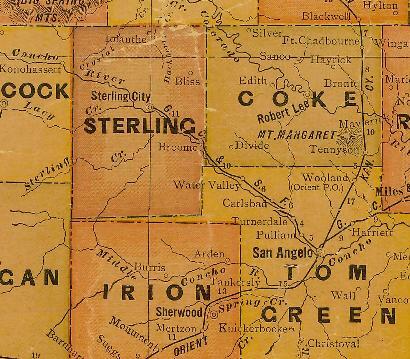 Founded in the mid 1920s, it was a stop on the Panhandle and Santa Fe Railroad. The name honored C.A. Broome, a rancher and landowner in the region. The community-to-be was granted a post office although the proximity to Sterling City stymied growth. The post office closed its doors in 1939 and after WWII, the town consisted of a store / filling station with a population of just 25. The 1980 census reported just 18 residents and by 1990 there was no report at all.